The New York Times number one bestselling title. Bravery, courage, fear and love in a time of war. As the war progresses, the sisters’ relationship and strength is tested. With life changing in unbelievably horrific ways, Viann and Isabelle will find themselves facing frightening situations and responding in ways they never thought possible as bravery and resistance take different forms in each of their actions. 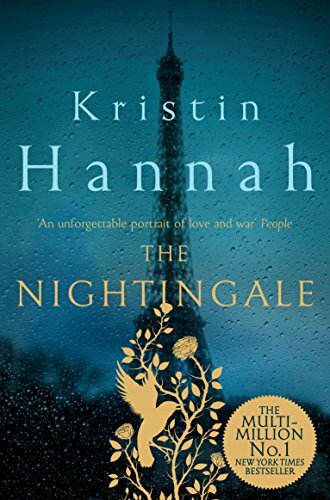 Vivid and exquisite in its illumination of a time and place that was filled with atrocities, but also humanity and strength, Kristin Hannah’s The Nightingale will provoke thought and discussion that will have readers talking long after they finish reading. Kristin Hannah is a popular thriller writer with legions of fans, but her latest novel, The Nightingale, soars to new heights (sorry) and will earn her even more ecstatic readers. Both a weeper and a thinker, the book tells the story of two French sisters – one in Paris, one in the countryside – during WWII; each is crippled by the death of their beloved mother and cavalier abandonment of their father; each plays a part in the French underground; each finds a way to love and forgive. If this sounds sudsy. . . well, it is, a little. . . but a melodrama that combines historical accuracy (Hannah has said her inspiration for Isabelle was the real life story of a woman who led downed Allied soldiers on foot over the Pyrenees) and social/political activism is a hard one to resist. Even better to keep you turning pages: the central conceit works – the book is narrated by one of the sisters in the present, though you really don’t know until the very end which sister it is. Fast-paced, detailed, and full of romance (both the sexual/interpersonal kind and the larger, trickier romance of history and war), this novel is destined to land (sorry, again) on the top of best sellers lists and night tables everywhere. I very much enjoyed Kristin Hannah character development and story. This book is written better than many books about WWII. The reader experiences the struggles and fear of those living in a Nazi occupied country. I am very, very troubled however. When I read about Isabelle organizing an escape route for airmen whose planes were shot down in France and then escorting them safely to Spain with the assistance of reluctant Basque, I had to stop because I clearly remembered reading this before. De Jongh’s/Isabelle’s invisibility to the Germans because she was “just” a woman: collaborating with the British to fund the escape of airmen from France; de Jongh’s/Isabelle’s capture in the Pyrenees by the Nazi’s then interrogation and Nazi’s disbelief and rejection of the idea that a woman was capable of doing this; and de Jongh’s/Isabelle’s imprisonment in Ravensbruck women’s concentration camp. Why am I troubled? I searched the book, several interviews with the author and Ms. Hannah website and there was no mention of specific name “Andree de Jongh.” Hannah acknowledged on her website that her search led her to “a story of a young Belgian woman who created an escape route out of Nazi occupied France.” I strongly believe that the author should have dedicated, credited or acknowledge the name of Andree de Jongh in the book where it was easily visible to the reader. De Jongh is as invisible to the author as she was to the Germans and in a book that celebrated the bravery of women during war. Was Vianne’s character based on a brave woman who also deserved bold recognition? This makes me sad. What a beautiful reminder not overlook women and their strength. Even as a woman, I’m guilty of doing that sometimes. I love pictures and the author has some beautiful pictures of places that inspired the locations in her book. I’m a geek for any reference to art or culture, so when I saw a reference to “drab-eyed, dark-clothed people who looked like they belonged in an Edvard Munch painting.” (pg 239) I had to look it up. He’s most famous for doing The Scream. The Nightingale deserves all the hype and awards it’s gotten.